We can’t complain about the $50 price tag T-Mobile has already assigned to the Nokia Lumia 710, but like anyone else, we do love a good deal. 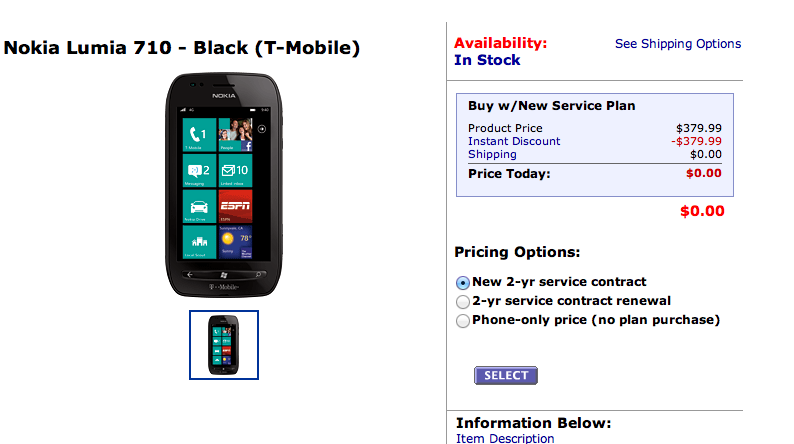 Walmart is offering up the Lumia 710 free, either in black or white for new customer contracts with a two-year agreement. You can avoid the contract for just $380 or re-sign for $50, the same price as T-Mobile is charging. Not to be outdone, CostCo is rocking an even better price tag for a two-year new activation for just one penny. A qualifying two-year upgrade will actually earn you a penny with a $50 mail-in rebate against your purchase price of $49.99. Want to add a line? That’s a penny. Oh, one more “limited time offer” from T-Mobile direct, who are offering an extra $30 off qualifying upgrades. Log into your myTmobile to find out more details! ← Nokia Lumia 900 With Upgraded 12 Megapixel Camera Coming To T-Mobile In Q3? When I see deals like this on such a new phone I begin to suspect that it just might be a stinky piece of crap or something. Check the reviews on Tmobile website. I believe this is not a crappy cellphone. Definitely not a crappy device. I’ve had mine since last Thursday and I absolutely love it. Way better than the piece of crap Samsung Android based OS that I had previously. The only negative I can see is the amount of available apps and those that are available are often at a cost. But the apps, in general, seem to be less buggy and smoother with the Microsoft OS. I usually feel that way too but I think they are just trying to get their foot in the door for bigger and better things if this phone takes off for them. Hopefully it does because of the price and because more choices are always better. Let’s just hope others don’t think the way we do and turn the other way before looking. For me however its Android-less so it doesn’t catch my eye at all. For others it might be just what they are looking for. Checked out the 710 today at my local store. Really nice device. Feels good in the hand. Looks nice. Too small for me, I have a HD7 now, but I’m sure my wife and daughter will like it. I find it nice that Nokia is trying to make a comeback in the US. However I don’t know if I personally would pick up a phone that runs on Microsofts mobile o/s even though I heard its a lot better than it use to be. I think I will continue to stay with my Android devices. Maybe if Nokia would make an Android device I would be interested. They have always seemed to build quality phones… but then again so does BlackBerry and I don’t think I will ever purchase another RIM product since they seem to be moving further away from the competition. Brought it when it first launch. It one good phone. Gonna keep it until something big happened..
that is not correct. right on our rebate form, it says minimum $20 data plan required. I am not eligible for upgrade yet. Can I still get it for $50 from Walmart and resign the contract? no. indirect dealers dont do early upgrades. best deal on the lumia: on prepaid its $199 when you buy a $50 refill. Where is that offer available? Any Tmo store. They might not know about it if they dont read updates in their email, but all they have to do is sell you an epin50 and the lumia and you get an instant discount with no contract. you’ve got it. if $50, $60 or $100 refill is purchased along with certain phones, a discount is automatically added. I haven’t tried using a windows phone with the web2go plan. worth a shot and you can always return it. UglyPete, let me get it straight. If I go to T mobile store and buy $50 refill than lumia will be $200. Is that how it goes? Mine should should be arriving by the 18th, It was $19.99 after a $50 mail in rebate from Tmobile Customer Care. I may send it back….i can’t grasp paying 30 for limited data….I……….must………..hold……….on…….to……my 5.99 unlimited data! Well I have a 20 day buyers remorse period…..
you could have gone with $20 2gb and still get the rebate. also, that remorse period most likely wont put unlimited data back on. they are supposed to tell you that once you go to a new plan, you cant go back to the old one. The galaxy nexus is my main phone, but my radar is the perfect work phone. I love the size and weight. Actually…. That price is only on the Walmart website. And phones sold on the Walmart Website are through a 3rd party (justwireless.com I think; if you go this route, read the terms carefully). In stores, it is $18.88 with 2 year upgrade (and data). let’s talk runs the walmart site. I’m confused…how is CostCo’s price tag of $0.00 “even better” than Walmart’s price of $0.00? A couple reasons: Costco has the price at (0.01), actually earning you a penny. Additionally, Costco gives a free accessory bundle with every phone they sell as well as a 90 return period (vs 14) and their sales folks arent Walmart employees (that should speak for itself).